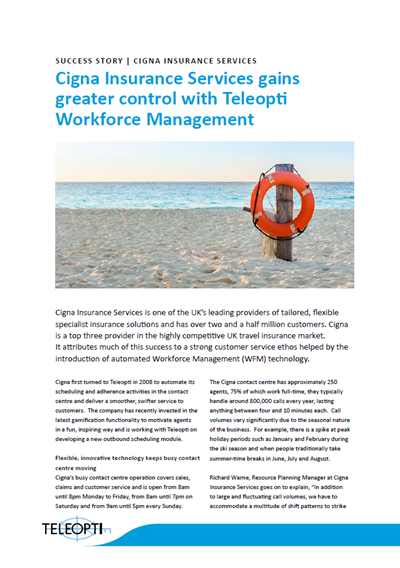 For Cigna Insurance Services, Teleopti WFM is recognised as a strategic resource planning and people management tool covering all types of channels, incl Web-Chat. Intraday control and adherence monitoring makes it possible to apply any necessary schedule changes quickly and efficiently. Cigna relies on Teleopti WFM to create flexible, workable shifts to maximise valuable skills and resources, to keep agents happy and maintain excellent customer service at all times. Most recently, Cigna has invested in new gamification features from Teleopti, a move which the company anticipates will bring far-reaching benefits.